Pain research is still dominated by biomedical perspectives and the need to articulate pain in ways other than those offered by evidence based medical models is pressing. Examining closely subjective experiences of pain, this book explores the way in which pain is situated, communicated and formed in a larger cultural and social context. 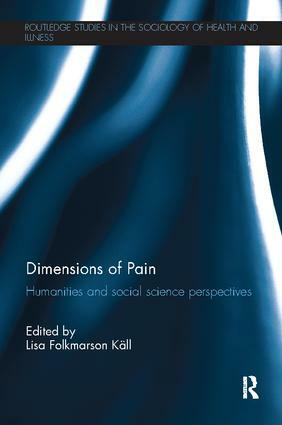 Dimensions of Pain explores the lived experience of pain, and questions of identity and pain, from a range of different disciplinary perspectives within the humanities and social sciences. Discussing the acuity and temporality of pain, its isolating impact, the embodied expression of pain, pain and sexuality, gender and ethnicity, it also includes a cluster of three chapters discusses the phenomenon and experience of labour pains. This volume revitalizes the study of pain, offering productive ways of carefully thinking through its different aspects and exploring the positive and enriching side of world-forming pain as well as its limiting aspects. It will be of interest to academics and students interested in pain from a range of backgrounds, including philosophy, sociology, nursing, midwifery, medicine and gender studies.